I feel like I should follow up the Ikea post by saying that last night I unpacked all of it and started putting it away and I LOVE MY NEW THINGS. I really didn’t spend a lot and considering I haven’t done squat towards decorating in the past year I’ve lived there (save for two shelves from Pottery Barn), some inexpensive decorating is long overdue. First up, I unpacked my magazine files. I had two of them from my first Ikea trip with Allison in 2008 and got three more sets of two for six total. And boy did I fill them all up. I save all my issues of Real Simple and Entertainment Weekly, and the best issues of the other magazines (Best of/Worst of, Inauguration, Tribue Issues, etc). Once I started putting the magazines away neatly, I realized it was time for a bookshelf overhaul. I love books so you would think my display of them would be fitting to my love of books. Partially because I also have a love for silver picture frames, and they were competing with space. 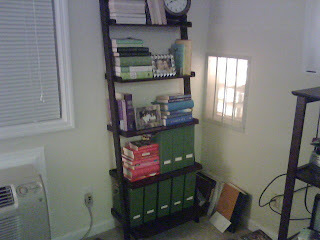 I had seen bookshelves organized by color before but never thought I could pull it off – my books weren’t colorful! Or so I thought, until I started pulling them off the shelf and stacking them by color. I removed a few of the dust jackets and what do you know? A stack of yellow, purple, red/pink, blue and green! I edited the silver frames down to three and arranged, rearranged and rearranged until I got a look I like. The camera shot doesn’t really translate it well but trust me, it looks good and is a much better improvement over the chaos that was going on previously: a clock, picture frames, magazine racks, two artsy wine glasses, a pewter horse head (from Evan, don’t ask), more magazines and stuffed in between all of that, my books! 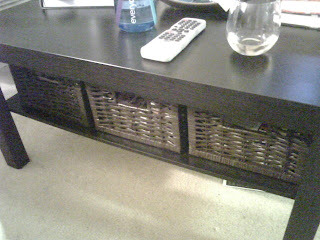 Next, I got out the three wicker baskets I had purchased to go under my coffee table. That poor coffee table serves as a footrest, dinner table and a crap magnet. I did quick math in Ikea to decide that I could get three of them on the shelf and they look great. I also added a coffee table book to the table top, a candle stick, two frames and a little dish I use for pens, keys, etc. 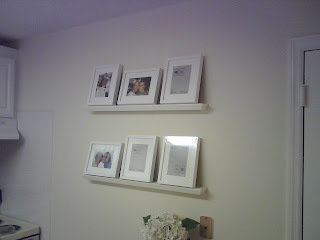 Next I took off the silver frames I had on my Pottery Barn shelves and put up the white gallery looking frames I picked up at Ikea. The whole effect is much cleaner and subtle, and once I get them all filled with 5x7 pictures, it will be exactly what I was going for! The last item that needs attention I couldn’t attend to immediately. I bought a small bar with hooks that I want to hang by my stove for spoons, spatulas, etc. The problem is that the entire wall by my stove is tiled. Since I am renting and can’t even paint a wall, I don’t think leaving four gaping holes in the backsplash would be a good idea. I am waiting for permission from my landlord to hang the bar and leave it, an option I don’t mind since it cost me only $2. Since there is hardly any drawer space, I’m sure the next tenant would appreciate having another storage option. I know I would. In the picture below, just use your imagination! 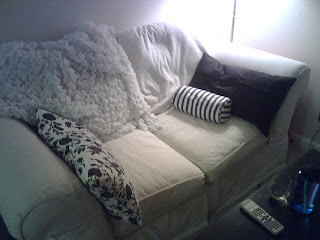 Last but not least, the couch pillows. They also look better in person. But here they are. Baby steps! Next up, some curtains and a rug to tie the black and white from the couch in with the color from the bookcase! And a recap of the portion of my time in DC that wasn’t spent in Ikea. And you said you couldn't decorate?! I think it all looks great! I really like the color-coded book shelf. Love that Ikea. Your bookshelf looks awesome! I'm pretty sure I need some of those magazine files considering I have towering stacks of Vogue and Vanity Fair anchoring one end of my coffee table. Cute! Your new stuff looks great!